Voith Meri Environmental Solutions, Inc. is helping to set higher standards for wastewater treatment with the addition of the Effluent Treatment Plant at Liberty Paper Incorporated in Becker, Minnesota. Liberty Paper (LPI) is located in the state of Minnesota in the Midwest of the United States. The state is known as “Land of 10,000 lakes” due to the tremen¬dous amount of lakes dispersed all around the state. LPI is a state-of-the-art paper mill that recycles old corrugated containers into new paper for packaging. The mill manufactures recycled paper from more than 200,000 tons of old corrugated containers each year. As part of the Liberty Diversified International (LDI) family, LPI is extremely involved in their community. Liberty Paper’s (LPI) need for this facility was sparked by their steady growth and desire to maximize production. When Meri and LPI began negotiations for an effluent treatment plant (ETP), the local water treatment facility had reached its capacity and LPI had outgrown the wastewater infrastructure, which was provided by the municipality. Either the city had to upgrade their operations to treat the increased CBOD load or the burden had to be taken off the city. Anaerobic processes are used for the treatment of highly loaded effluents. Anaerobic bacteria in the form of biopellets are used for the conversion of dissolved COD in to methane (biogas). In the paper industry anaerobic technology is mainly used in board and packaging mills. This stage balances volume and load and serves as an initial step for further anaerobic degradation. Safe and reliable treatment of biogas. This process step helps to reduce odor, can remove some of the remaining COD and triggers the precipitation of calcium. The elimination of calcium in the process effluent with the LIME TRAP® enables an optimized operation of succeeding aerobic equipment. Anaerobic treatment of waste water has found a perfect application in industrial waste water treatment, especially in applications with high COD concentrations. Compared with aerobic treatment, the main advantages of anaerobic treatment could be summarized as: reduced footprint, lower energy consumption and minimum sludge production. Among the different anaerobic reactor technologies available, the R2S Reactor achieves volumetric loads as high as 25 kg COD/m3/day. Considering that the required tank size for most conventional activated sludge systems is 1.5 kg COD/m3/day, the R2S has a definite advantage. One other important consideration is the fact that the R2S is up to 30 m in height, which significantly reduces the footprint required for effluent treatment plants. Aerobic treatment requires oxygen to oxidize the organic compounds. This oxygen is introduced into the system by means of blowers and other devices that have a high-energy consumption. A system designed to treat 10,000 kg COD/day, for example, would require 15 MWh per day. On the other hand, each kilogram of COD treated in an anaerobic system yields 2.4 kWh – a difference of 39 MWh per day! Aerobic treatment yields a large amount of biological sludge that needs to be removed from the system and dewatered or stabilized in order to optimize sludge disposal costs. Depending on the system, up to 60% of the converted COD will be converted to new sludge. This number contrasts with the average sludge growth observed in anaerobic systems of 2% to 5%. Left: Anaerobic treatment plant dominated by the R2S Anaerobic Reactor. Right: LIME TRAP® for the removal of calcium carbonate. 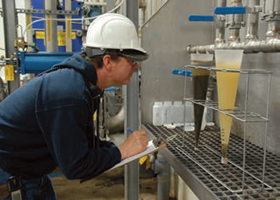 Paper mills in general, including OCC mills like LPI, require large amounts of water and therefore require a large waste water facility to cope with the high COD and calcium levels typically found in this application. The state-of-the-art R2S Reactor design allows for continuous and efficient removal of calcified biomass. LPI produces around 750 sTon per day, the COD discharge is 9,700 kg COD per day. The ETP system that Meri designed utilizes a cooling stage followed by a pre-acidification tank and the R2S Anaerobic Reactor. The process continues with a CO2 stripping reactor, which facilitates hydrogen sulfide conversion for odor reduction and calcium carbonate precipitation. The last step is a LIME TRAP® for calcium carbonate and solids removal as well as a centrifuge decanter for sludge thickening. The effluent treatment plant has proven to be robust and efficient since the start-up. With an average soluble COD removal greater than 90% and 98% for BOD5, the plant reduces the COD from the average 9,700 kg COD/day to 863 kg per day.